A delicious light and moist Lemon Yogurt Cake is the perfect after dinner treat or as a sweet with your morning coffee. This low fat cake recipe not only tastes fantastic, but it’s low in fat and calories, and feels incredibly decadent. It has the perfect combination of sweet and sour, and the lemon sugar glaze is oh so yummy. And with the weather starting to to warm up, I’ve been craving something fresh and bright. So I did a makeover on Ina Garten’s Lemon Yogurt Cake, and was thrilled at how amazing the cake tasted after the alterations I did to make it more Weight Watchers friendly. Enjoy! A delicious and decadent dessert that’s bright and flavorful, this Lemon Yogurt Cake Recipe is a real treat! Just 6 Points per slice. Preheat the oven to 350° F. Grease an 8 1/2 by 4 1/4 by 2 1/2-inch loaf pan. In another bowl, mix together the yogurt, sugar, eggs, lemon zest, almond extract and vanilla. Add the wet ingredients into the dry ingredients and slowly whisk together. Fold the applesauce into the batter. Pour the batter into the prepared pan and bake for about 50-60 minutes, or until a cake tester placed in the center of the loaf comes out clean. For the glaze, combine the confectioners’ sugar and lemon juice. If the glaze is appears too thick, continue adding lemon juice until it’s runny enough to pour. Carefully remove the cake from the pan and place it on a baking rack over a baking sheet or wax paper. While the cake is still slightly warm pour the glaze over, allowing it to drip down the sides. Cut into 8 equally sized slices and serve immediately. This sounds delicious so I put this in the WW calculator to see if 8 slices really came to 6 points. On the WW calendar on the WW site, it comes to 13 points for 8 slices !!! That’s with glaze on it. Even without the glaze, 1 slice comes to 9 points. I’m not sure where you get 6 points from but this is very disappointing. I am glad I did the calculations myself rather than make the recipe and go with the points that were provided. Is whole wheat pastry flour similar or the same thing as whole wheat all-purpose flour? The difference between whole wheat pastry flour and all-purpose flour is the type of wheat and the parts of the wheat berry used. In whole wheat pastry flour, the entire wheat berry is used in the milling process, and the type of wheat is a soft wheat, which has less gluten-forming proteins. This type of flour is used for pies, muffins, cookies, cakes – any pastry that you want to be tender. All-purpose flour is only the center part of the wheat berry, called the endosperm, which is why it is whiter in color and smoother in texture than whole wheat flour. Usually, all-purpose flour is milled from hard wheat, which has a lot of gluten-forming proteins. Since the gluten-forming proteins in these two types of flour are so different, they really shouldn’t be interchanged – if you use all-purpose flour for the pastry flour, your pastry will probably be a little tougher and drier. For pies or cookies, this probably won’t be very noticeable, but for cakes it may be pretty noticeable. Loved it! The texture was different from what I expected but thats probably because I overcooked it, next time I will be checking it at 40 min. Just found your blog. 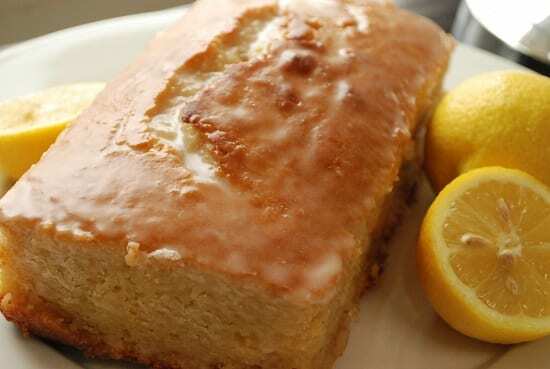 Can’t wait to try your recipes… Especially this lemon pound cake! Thank you for sharing! I just started WW and can’t weight to try some of these recipes! Thanks.